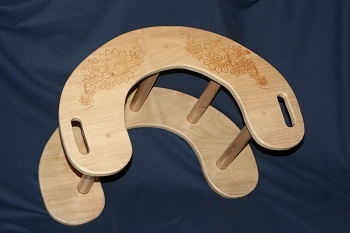 Finally found an amazing manufacturer for these birth stools! Or should I say "they found us!" 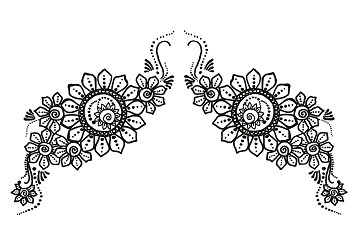 Crafted with care along with a beautiful henna wood etching on top. 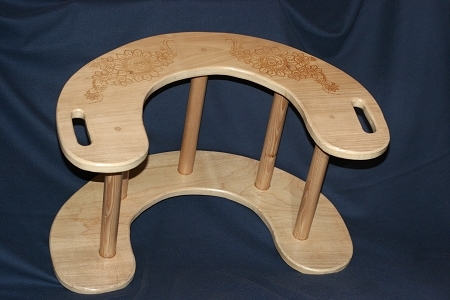 This stool is a true “Labor Of Love”; it is totally handmade by my father and daughter, both champion woodworkers from a design that I created with the help of a successful local midwife. It is made from poplar wood, which makes it light to carry (about 9 pounds). 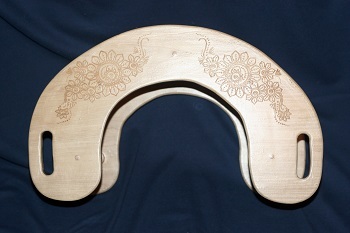 The top and base are entirely one piece so there is no worry of splitting or cracking. The stool has been designed with a wider seat so that a laboring woman can more comfortably sit on it without fear of toppling over. 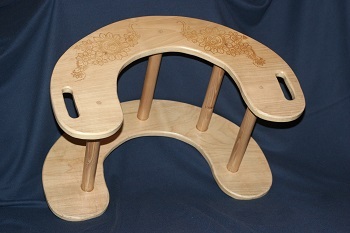 We have added extra base support and reinforcement so the stool is very stable. The entire stool is covered in a protective and sanitary polyurethane coating; which makes for easy cleaning - simply wipe with a bleach and water solution and it dries quickly. The highlight of this stool is the henna-like design etched into the wood on the top of the stool – a work of art that functions as a comfortable place to help bring your baby into your arms! This stool is available in standard 14″ overall height or special ordered in 16” overall height. Please allow 4-6 weeks for delivery as each stool is custom made.